The Davis Vantage Pro2 is manufactured right here in the U.S. by Davis Instruments and is the first weather station in its price range to use frequency hopping spread spectrum radio to transmit data. This allows it to transmit and receive data up to 1000 feet (line of sight) which is more than three football fields in length! The Vantage Pro 2 is available in either a wireless or cabled configuration making it suitable to all types of installations. 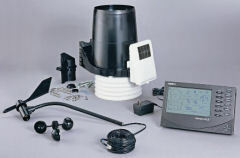 Its integrated sensor suite combines a rain collector, temperature and humidity sensors, and an anemometer into one package. This makes setup easier and more convenient than ever and also improves performance and reliability. In order to improve accuracy the temperature and humidity sensors are housed within a radiation shield. This shield protects the sensors from solar radiation and other sources of radiated and reflected heat. The Davis Vantage Pro2 Plus includes everything that comes with the Vantage Pro2 weather station and adds solar radiation and UV sensors. Whether you choose the Pro2 or the Pro 2 Plus you can be assured you're getting a professional level weather forecasting system with an extensive array of features for an affordable price. Browse the selection of Davis Vantage Pro 2 weather stations and accessories that are currently for sale on eBay - you simply won't find better prices anywhere else! If you don't see what you need search here for even more weather stations.